Precision cutting is the final step in the process of producing high-quality parts. If the parts are cut incorrectly then all of the work up to that point is wasted. For this reason, we have invested heavily in precision cutting equipment. Our pressmen and die-makers have over 100 years of combined experience in this field. We manufacture our steel rule dies in-house. The dies boards are produced using our 400 Watt Coherent laser. This state of the art machine allows us to produce dies that can hold tolerances as tight as +/- .005”. We have personnel with decades of experience in bending and installing the steel into the wood die-boards. Having in-house die-making capability gives us an advantage over our competitors. We are able to produce the tooling less expensively than our competition because they have to purchase from an outside vendor. Also, we can produce steel rule dies quicker since we don’t need to wait for dies to be shipped in. Additionally, we can make quick adjustments to the dies if they are not cutting properly. 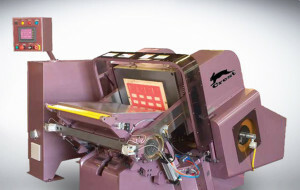 We have 2 clam shell die-cutting presses that allow us to die-cut sheets as large as 25” x 38”. Our Crest Die-Cutting press (purchased new in 2013) is a precision cutting machine that has features such as dual micrometer setting and a heated platen. These features give us the ability to produce accurate cleanly cut plastic parts. The machine allows us to do embossing of plastics such so that we can make raised keys on graphic overlays. We can also kiss cut pressure sensitive materials cleanly and consistently over an entire sheet. 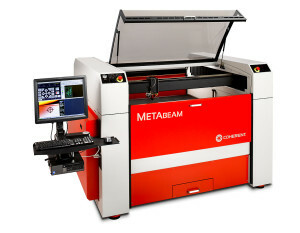 In addition to producing precision cut die boards, we also use our Coherent laser to cut plastic and metal parts. The laser enables use to achieve tolerances as tight as +/- .001”. We can also make cuts and produce shapes that would be difficult or impossible to produce with a steel rule die and a clamshell press. Laser cutting is an excellent choice for producing prototypes and short run work because tooling is not required. We have several pieces of traditional cutting equipment used in the fabrication of nameplates, decals and labels. This equipment includes guillotine cutters up to 41” wide with MicroCut capability. Plotters are used to kiss cut pressure sensitive materials such as vinyl and polyester. We use plotters to produce a wide array of custom shaped decals and lettering. The primary advantages of this technology are that tooling is not required and short run jobs can be done quickly and economically.